Below are two vintage sanrio collectible items that are up for sale on my eCrater Store. 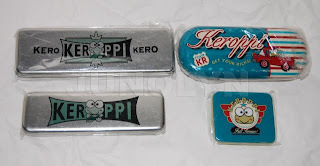 ^ The first picture is a four piece set of Keroppi pencil case tins. They are all in mint condition. The left set is from 1995 and on the right side is from 1996. Still in their original plastic. These are from my personal treasured collection. They have been in secure bubble wrap and been stored away neatly for a couple of years now. 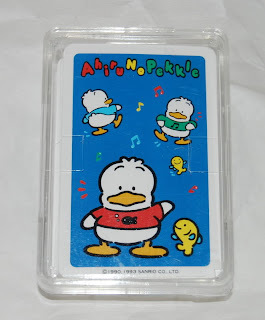 The second item for sale is a vintage Pekkle Playing cards. This is still in mint condition and surprisingly has no cracks in the clear case. I have found most vintage playing card cases comes with at least one crack and this is a rare find to have no cracks at all. 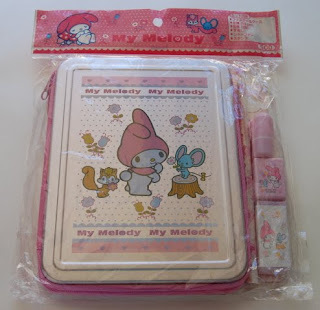 Below is a 2003 zipped My Melody School Set that is still sealed in it's original packaging. The school set includes an eraser, sharpener, plastic ruler, pencil, and stamp. I bought this online with the intention to one day open and make the pencil and eraser to add to my collection of growing pencils and erasers. 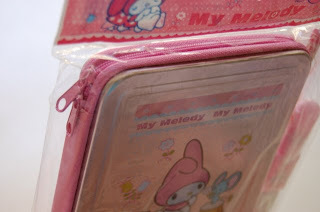 Also, I do like the design of the My Melody zipped case. I could see myself using this case, but I figured in the long run that I really wouldn't touch it... so it's up for sale.